I know, not such an original title, but it gets to the point! I made this card with the Clean and Simple Stamping FTL#155 here. ﻿ And then I used the Splitcoast Color Combination#338 here, too. The colors to use are Cherry Cobbler, Calypso Coral and More Mustard. I started with some More Mustard card stock and ran it thru the Big Shot with the Square Lattice embossing folder. I used some DSP from the Paisley Petals DSP and matted that and a piece of Very Vanilla with some Cherry Cobbler. I stamped grateful and the dotted leaf from Falling Leaves in Cherry Cobbler. I stamped the other two leaves in Calypso Coral and More Mustard, cut them out and popped them up with Stampin' dimensionals. Finally, some new 3/8 inch Cherry Cobbler Quilted Satin Ribbon from the Holiday Mini finishes it off. I used the Stamping 411 Sketch#218 for this card. The base is Lucky Limeade and I added some Melon Mambo and then papers from the Cheerful Treat DSP. I punched a Melon Mambo piece with the 2 1/2 inch Circle punch and then ran it thru the Big Shot with the Perfect Polka Dots embossing folder. I stamped the flower from Posy Punch in Melon Mambo and trimmed it down a bit. I layered that onto a Lucky Limeade piece punched with the Fancy Flower Punch. I used the 1/2 inch Circle punch for the Limeade circle and added a Limeade Designer Printed brad to the center, popping up the flower with Stampin' dimensionals. I stamped the greeting from Perfect Words in Melon Mambo. Finally, some 1/2 inch Melon Mambo Scallop Dots ribbon finishes it off. I made this card with the Playful Polka Dots Simply Scrapin' Kit(only available until August 31st) and for the Create with Connie and Mary Sketch Challenge#164 here. I started with an Old Olive card stock base. 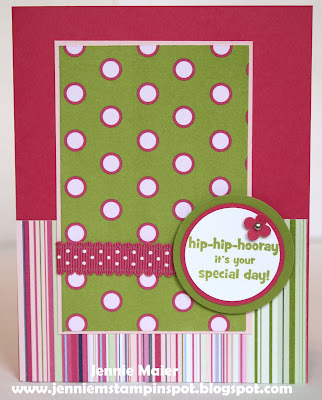 I added papers from the Playful Polka Dots SSK. I also added die-cut strips, the flowers and the stems. The only stamping on the card was the greeting from On Your Birthday. I stamped that in Old Olive, punched it out with the Word Window punch and popped it up with Stampin' dimensionals. How cute and quick is that? I made this thinking of you card for two challenges. First, the Splitcoast Sketch#347 here. And second, the PPA#108-CAS-Soften the Edges, here. The base is Perfect Plum card stock and I used the Corner Rounder punch on the two corners. I added three different patterns from the Nursery Nest DSP, rounding the corners of the Pear Pizzazz and Blushing Bride patterns. I stamped thinking of you from Sincere Salutations in Perfect Plum and punched it out with the Large Oval punch. I matted that onto a Perfect Plum piece punched with the Scallop Oval punch and popped it up with Stampin' dimensionals. Finally, some 3/8 inch Perfect Plum taffeta ribbon finishes it off. 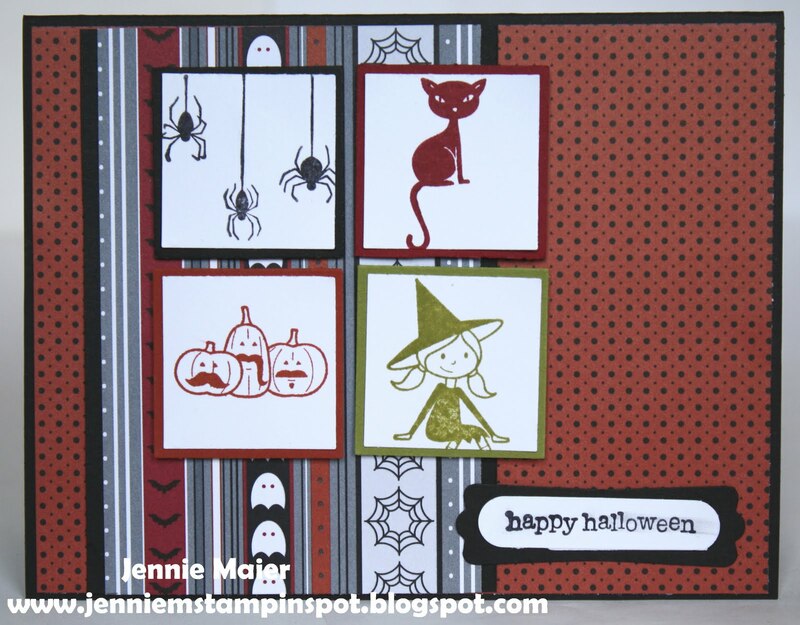 I used the Clean & Simple Stamping FTL#154 here for this Halloween card. It's also another sneak peek at the stamp set, Out On a Limb, from the Holiday Mini.The base is Cajun Craze card stock and I added papers from the Frightful Sight DSP. A piece of Old Olive was run thru the Scallop Edge Punch. I punched out a Whisper White circle with the 2 1/2 inch Circle punch. I stamped the broom and moon from Out On A Limb in Basic Gray. I colored the witch with my Cajun Craze, Basic Gray and Old Olive Stampin' Write Markers. I punched an Old Olive circle with the 1 inch Circle punch. I stamped the owl in Cajun Craze and popped it up with a Stampin' dimensional. I punched out the ghost pattern with the 3/4 inch Circle punch. The 1/2 inch Circle punch was used on the Cajun circle and the Itty Bitty Shapes Punches pack on the Basic Gray circle. 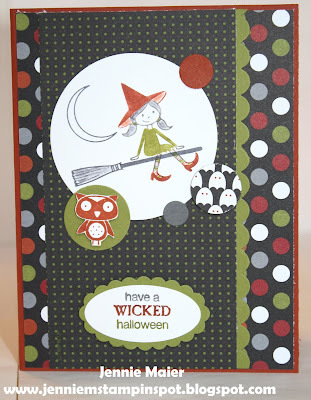 I used my Basic Gray, Cajun Craze and Old Olive Stampin' Write Markers again on the greeting from Wicked Cool. I punched that out with the Large Oval punch, layered it onto an Olive piece punched with the Scallop Oval punch and popped it up with Stampin' dimensionals. This card is for two challenges. First, I used the Stamping 411 Sketch#217 here. And second, the Splitcoast Color Challenge#337 here. The colors to use are Real Red, Night of Navy and Daffodil Delight. 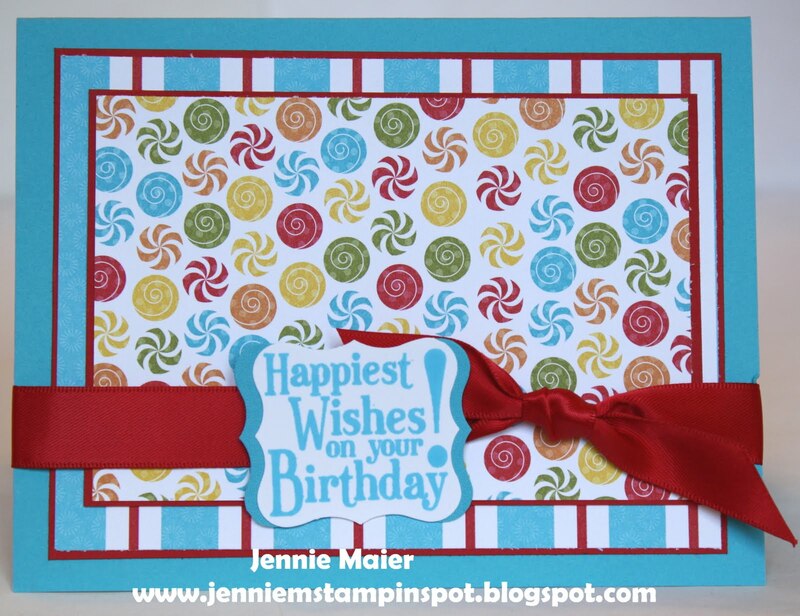 I started with a Real Red card stock base and added some DSP from the Big Top Birthday DSP. I punched out squares of Real Red, Daffodil Delight and Night of Navy card stock with the 1 1/4 inch Square punch. I cut squares of Patterns DSP Brights stack for the Real Red and Daffodil Delight pieces. I stamped A to Z in Night of Navy then trimmed it down to a square. I also stamped the greeting from Perfect Words in Night of Navy. I colored the apple from Fruit and Flowers with my Old Olive and Real Red Stampin' Write Markers, cut it out and popped it up with Stampin' dimensionals. Finally, some Daffodil Delight and Night of Navy 1/4 inch Grosgrain ribbon finishes it off. I used the MojoMonday Sketch#205 here for this thank you card. The base is Pool Party card stock and then I added some Calypso Coral. I also added three patterns from the Domestic Goddess DSP. I colored the flower stamp from Fruit and Flowers with my Lucky Limeade, Pool Party and Calypso Coral Stampin' Write Markers. 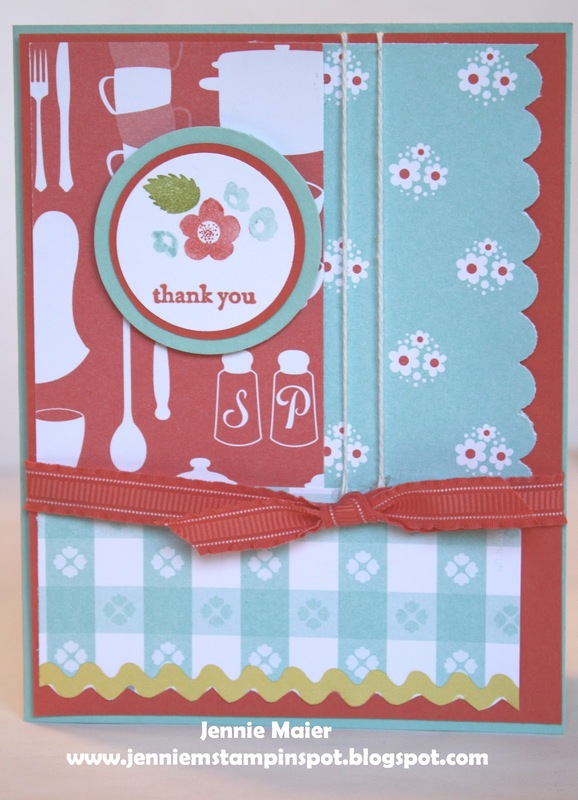 I stamped thank you from Teeny Tiny Wishes in Calypso Coral. I punched out the Whisper White circle with the 1 3/8 inch Circle punch. The Calypso Coral circle was cut with the Circles#2 Big Shot die. The Pool Party circle was punched with the 1 3/4 inch Circle punch. All the circles were popped up with Stampin' dimensionals. I took apart some Early Espresso/White Baker's Twine and adhered just the white pieces. Finally, some 3/8 inch Calypso Coral Ruffled ribbon finishes it off. 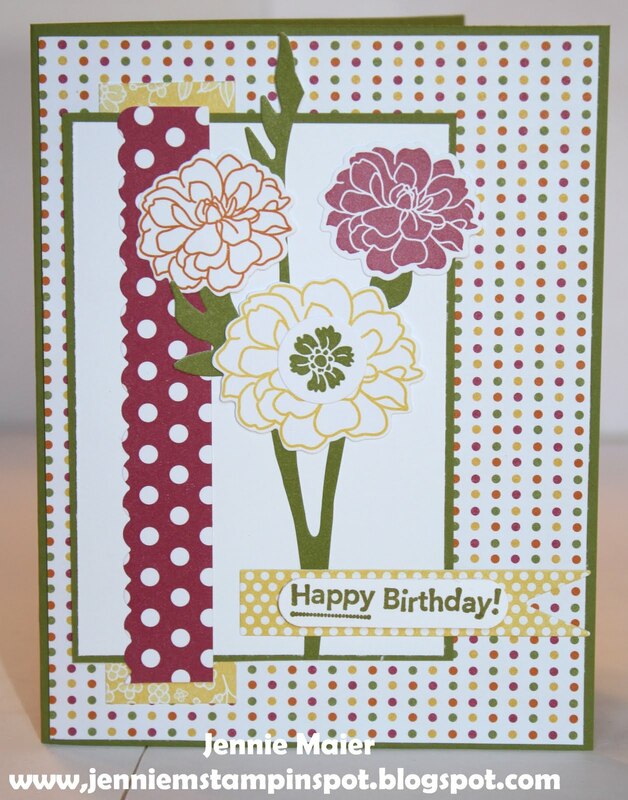 This bright and bold birthday card was made using the Stamping 411 Sketch#217 here. The base is Tempting Turquoise and then I added some papers from the Big Top Birthday DSP, matting them with Real Red. I stamped the greeting from Happiest Birthday Wishes in Tempting Turquoise and punched it out with the Curly Label Punch. I added some Tempting Turquoise behind that, also punching it with the Curly Label punch. I popped the labels up with Stampin' dimensionals. Finally, some 5/8 inch Real Red Satin ribbon finishes it off. Here's a sneak peek of a Halloween set from the Holiday Mini. It's called Out On a Limb and it's too cute! I used the PPA#107 sketch here. I started with some Basic Black card stock and added papers from the Frightful Sight DSP. I stamped the images on Whisper White in Basic Black, Cajun Craze, Cherry Cobbler and Old Olive. I punched them out with the 1 1/4 inch Square punch and layered that onto a coordinating piece of colored card stock punched with the 1 3/8 inch Square punch. 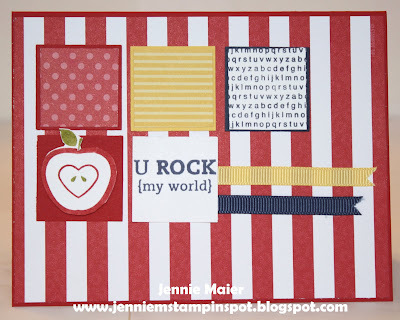 All of the squares were popped up with Stampin' dimensionals. Finally, Happy Halloween from Teeny Tiny Wishes was stamped in Basic Black, punched out with the Word Window punch and layered onto a Basic Black piece punched with the Modern Label punch. 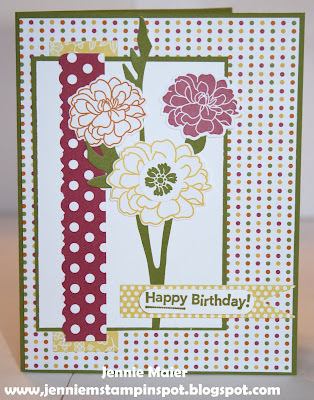 For this card I used the Clean and Simple Stamping FTL#153 here. And I combined that with the Create with Connie and Mary Color Challenge#163 here. The colors to use are Tangerine Tango, So Saffron and Pacific Point. The base is Pacific Point card stock and I added some Tango DSP from the Patterns DSP Brights Stack. I also added some So Saffron card stock and some Tangerine Tango 1/2 inch Scallop Dots Ribbon. 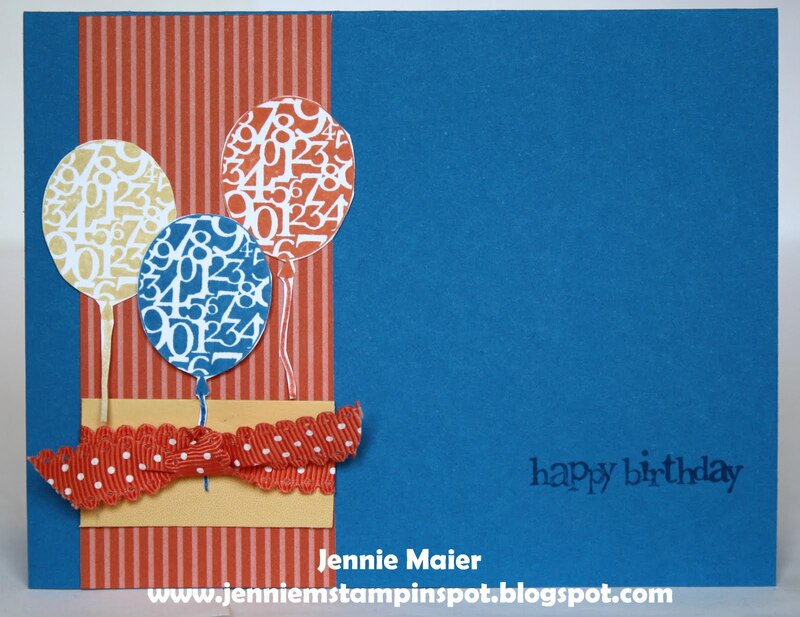 I stamped the balloon from Party this Way three times in each color, adding the string with my Stampin' Write Markers. 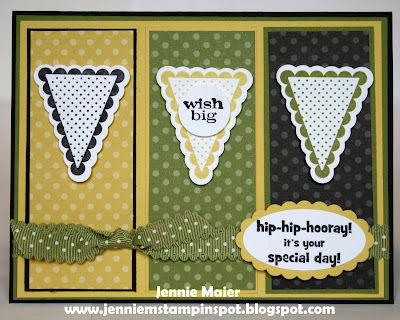 I popped up the Pacific Point one with a Stampin' dimensional. Finally, I stamped happy birthday in Pacific Point. I made this card for the Clean & Simple FTL#152 here. The base is Lucky Limeade and I added some Berry Blossoms DSP. I ran some Whisper White thru the Dotted Scallop Ribbon Border punch. I punched some Calypso Coral with the Decorative Label punch and cut it in half. Finally, I stamped thank you from Short & Sweet in Lucky Limeade. This card is for two Splitcoast Challenges. First, the Splitcoast Sketch#346 here. And second, the Splitcoast Color Combination#336, of Blushing Bride, Wisteria Wonder and Sahara Sand, here. The base is Sahara Sand card stock. 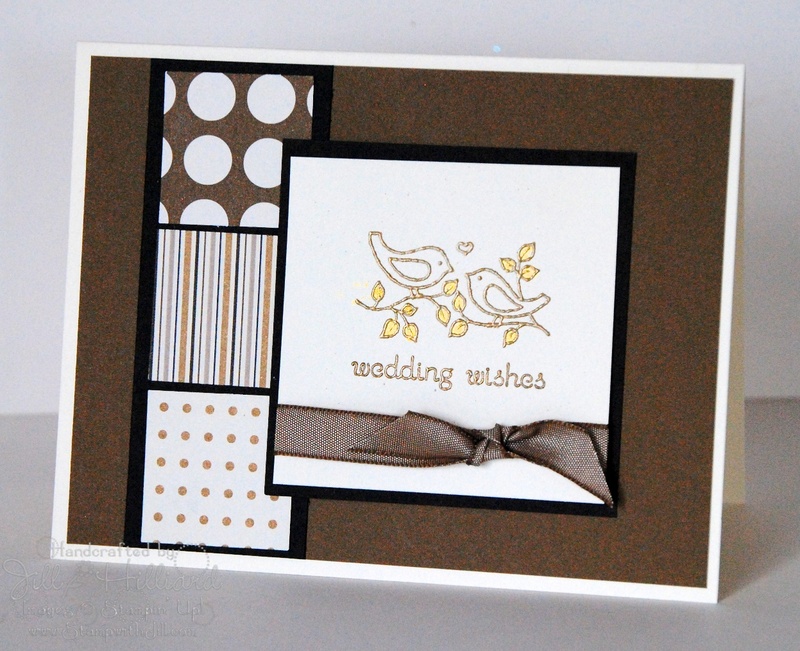 I ran a piece of Blushing Bride thru the Big Shot with the Square Lattice embossing folder. I added a piece of Flirtatious Specialty DSP. I stamped the images from Delicate Doilies in Blushing Bride, Wisteria Wonder and Sahara Sand. I stamped thanks so much from Sincere Salutations in Wisteria and punched it out with the Large Oval punch. That was layered onto a Wisteria piece punched with the Scallop Oval punch and popped up with Stampin' dimensionals. Finally, I added a piece of 1/2 inch Blushing Bride stitched-poly ribbon. I made this birthday card with the Stamping 411 Sketch#216 here. I started with a base of Wild Wasabi and added papers from the Just Add Cake DSP. I stamped the cupcake from Create a Cupcake in Early Espresso, Poppy Parade and Wild Wasabi on Whisper White and punched it out with the Cupcake Builder Punch. 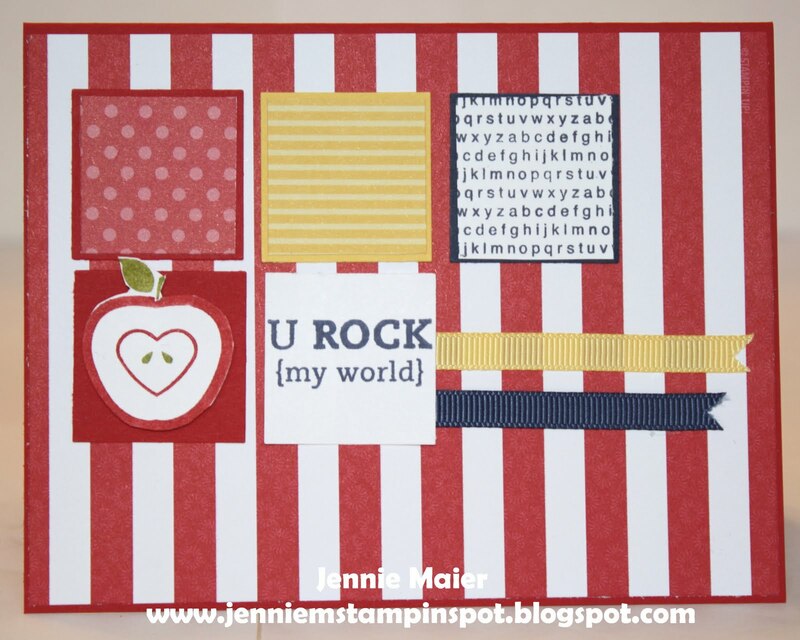 I popped it up with Stampin' dimensionals. 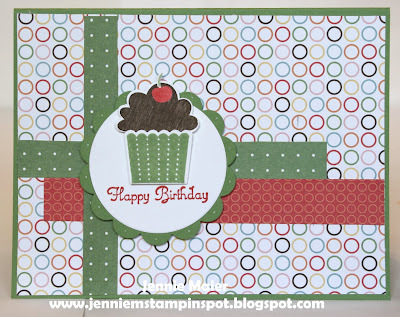 I also stamped Happy Birthday from that set in Poppy Parade. I punched out a Whisper White circle with the 1 3/4 inch Circle punch and a Wild Wasabi piece with the 2 3/8 inch Scallop Circle punch. 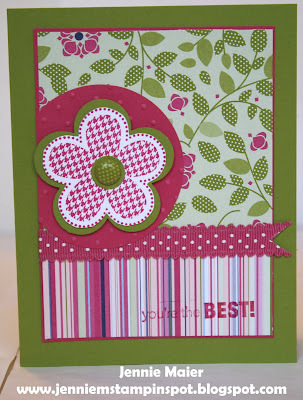 Finally, I popped up the entire scallop with Stampin' dimensionals. I used the Create with Connie and Mary Sketch Challenge#162 here for this card. My base is Daffodil Delight card stock. 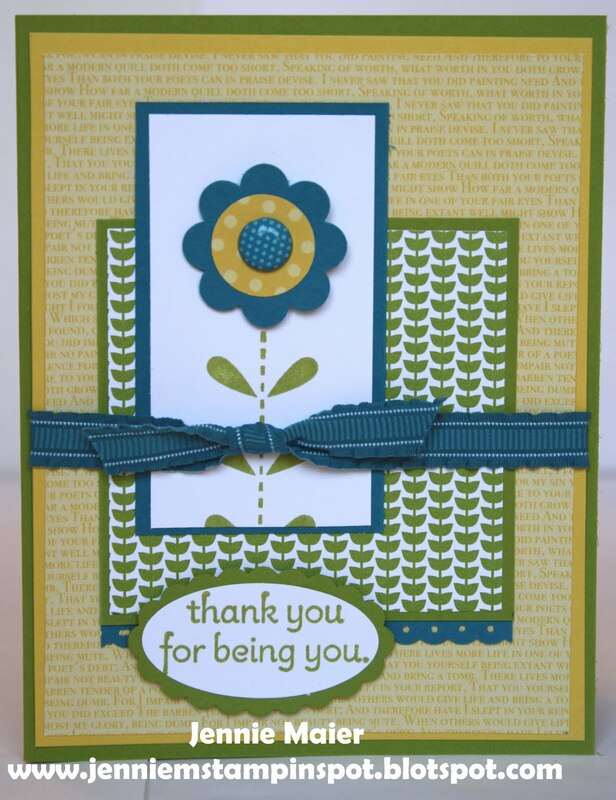 I added a Daffodil die cut and papers from the Playful Polka Dot Simply Scrappin' Kit. I used my Circles#2 Big Shot die to cut out the Daffodil circle and the Old Olive polka dot flower is another die-cut from the SSK. I stamped Hello from Posy Punch in Old Olive and trimmed it down. I punched a Daffodil circle with the 3/4 inch Circle punch and popped both circles up with a Stampin' dimensional. I added three flower die-cuts. Finally, some 5/8 inch Old Olive satin ribbon finishes it off. It's good to be back stamping again. Last week was a crazy one with my mom having surgery. She's home and on the mend so that's good! Here's a quick card for two challenges. First, I used the Splitcoast Sketch#345 here. And second, the PPA#106 here. It's to use 1 piece of DSP, 1 punch and 1 sentiment. 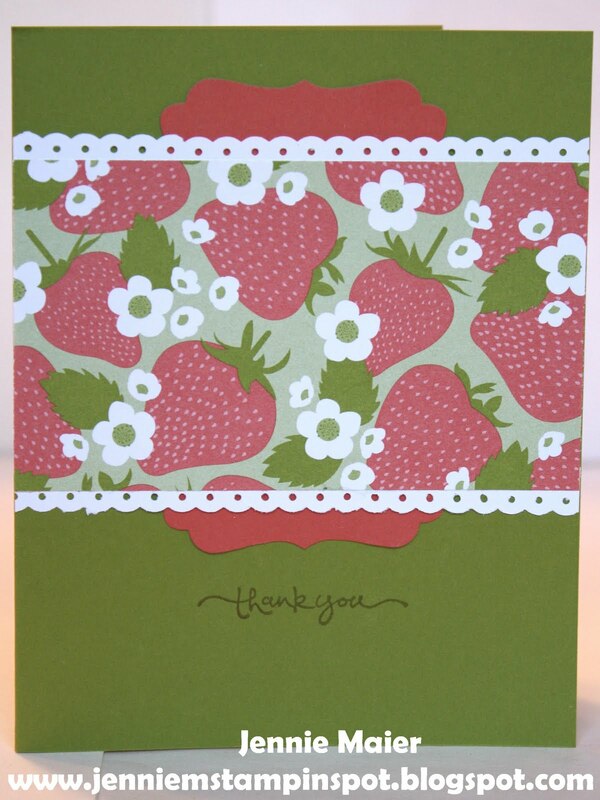 I started with some Melon Mambo card stock and added some Cheerful Treat DSP. I matted the polka dot piece with Pink Pirouette card stock. I stamped the greeting from Happiest Birthday Wishes in Lucky Limeade and punched it out with the 1 3/8 inch Circle punch. The Mambo circle was cut with the Circles#2 die and the Limeade one was punched with the 1 3/4 inch Circle punch. 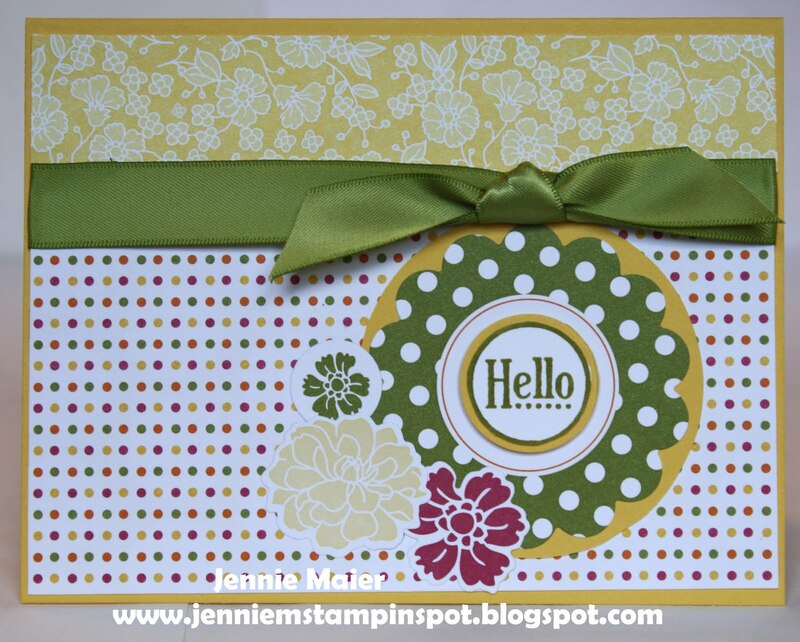 I popped up the circles with Stampin' dimensionals. 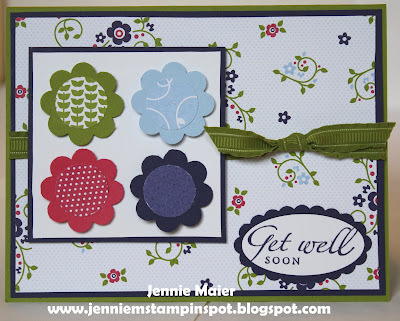 I used the Itty Bitty Shapes Punches pack for the Mambo flower and added a Silver Mini Brad to the center, popping it up with a Stampin dimensional. Finally, some Melon Mambo 1/2 inch Scallop Dots Ribbon finishes it off. I made this card for two challenges. First, the PPA Color Challenge#105 here. The colors to use are Lucky Limeade, Island Indigo and Daffodil Delight. And then with the Stamping 411 Sketch#215 here. The base is Lucky Limeade and I added some Daffodil Delight and then some Daffodil Patterns DSP from the Brights Stack. I also used some Limeade DSP from the Cheerful Treat DSP. I ran some Indigo thru the Dotted Scallop Ribbon Border punch. I stamped the stem from Bold Blossom in Lucky Limeade. I used the Blossom Bouquet Triple Layer punch for the Indigo flower and the 3/4 inch Circle punch for the Daffodil DSP center. 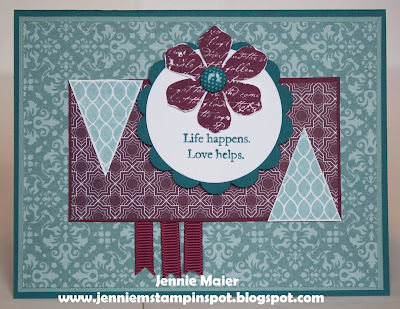 I added an Island Indigo Designer Printed Brad to the center and popped it up with Stampin' dimensionals. The sentiment was stamped in Lucky Limeade and punched with the Large Oval punch and layered onto a Limeade piece punched with the Scallop Oval punch. Finally, some 3/8 inch Island Indigo Ruffled ribbon finishes it off. This is my take on the Create with Connie and Mary Color Challenge#161 here. My base is Basic Black and I added some Old Olive then Daffodil Delight card stocks. I also used some Daffodil, Olive and Black Patterns DSP. 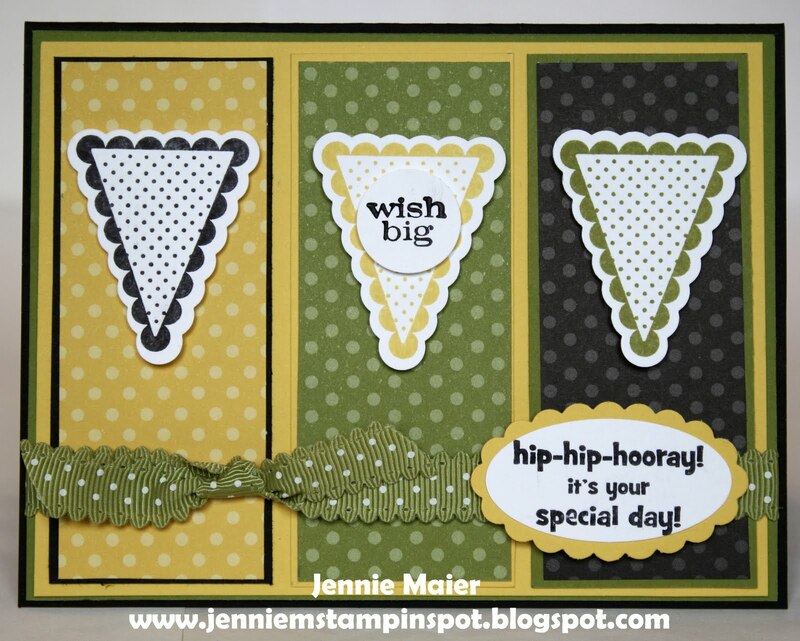 I stamped the pennant from Pennant Parade in each color and punched it out with the Petite Pennants Builder Punch and popped them up with Stampin' dimensionals. Wish Big was stamped in Black, punched out with the 1/2 inch Circle punch and popped up with a Stampin' dimensional. The greeting from Happiest Birthday Wishes was stamped in Black, punched out with the Large Oval punch and layered onto a Daffodil piece punched with the Scallop Oval punch. I popped that up with Stampin' dimensionals too. Finally, some 1/2 inch Old Olive Scallop Dots ribbon finishes it off. I saw this card by Jill Hilliard, loved the layout and made my own version. 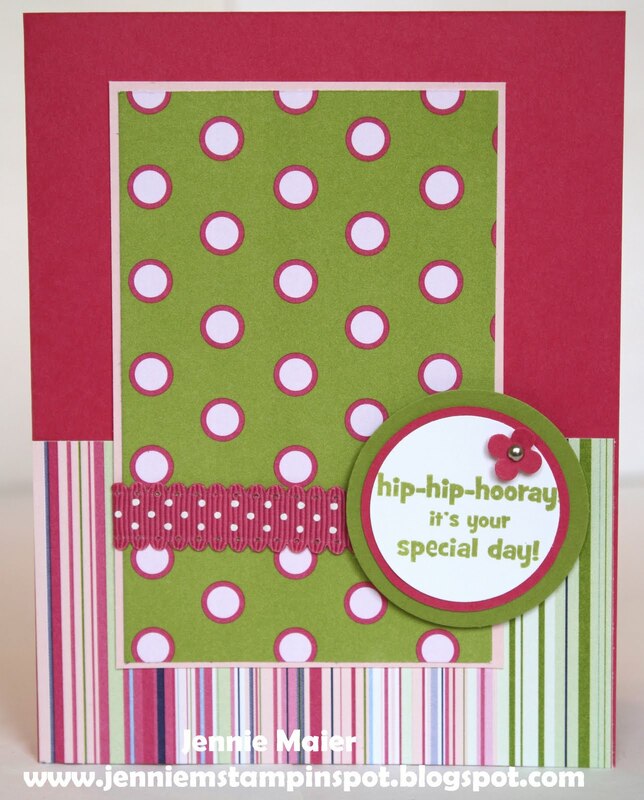 I used the Little Friends stamp set with papers from the Playful Polka Dots Simply Scrappin' Kit. The base is Pumpkin Pie card stock. I ran some Old Olive thru the Square Lattice textured impressions embossing folder. I punched out three squares of the Playful Polka Dots SSK with the 1 1/4 inch Square punch. I stamped the image from Little Friends in Black StazOn ink on some Watercolor paper and colored it in with my Crumb Cake, Chocolate Chip, Pumpkin Pie, Old Olive and Rose Red Stampin' Write Markers and Blender pens. I stamped get well wishes from Teeny Tiny Wishes and punched it out with the Curly Label punch. This is for the Splitcoast Sketch#344 here. I used my Color Coach (again) for the colors of Cherry Cobbler, Wisteria Wonder and Pretty in Pink. It actually suggested Pink Pirouette but I wanted to use some Pretty in Pink Patterns DSP. The base is Cherry Cobbler and I added Pretty in Pink and the Patterns DSP Subtles Pretty in Pink. I ran some Wisteria Wonder thru the Dotted Scallop Ribbon Border punch. I stamped the flowers from Flower Fest in Cherry Cobbler, Pretty in Pink and Wisteria Wonder. I added some Cherry Cobbler card stock and 1/2 inch Cherry Cobbler Scallop Dots Ribbon. I punched out the Cherry Cobbler circle with the 1 3/4 inch Circle punch, the Wisteria circle with the Circles#2 Big Shot die and the patterned Pretty in Pink piece with the 1 3/8 inch Circle punch. Thinking of You from Trendy Trees was stamped in Cherry Cobbler and punched out with the Large Oval punch. The Wisteria flower was punched with the Itty Bitty Shapes Punches pack and I added a Silver Mini brad to the center. Finally, all of the circles were popped up with Stampin' dimensionals. 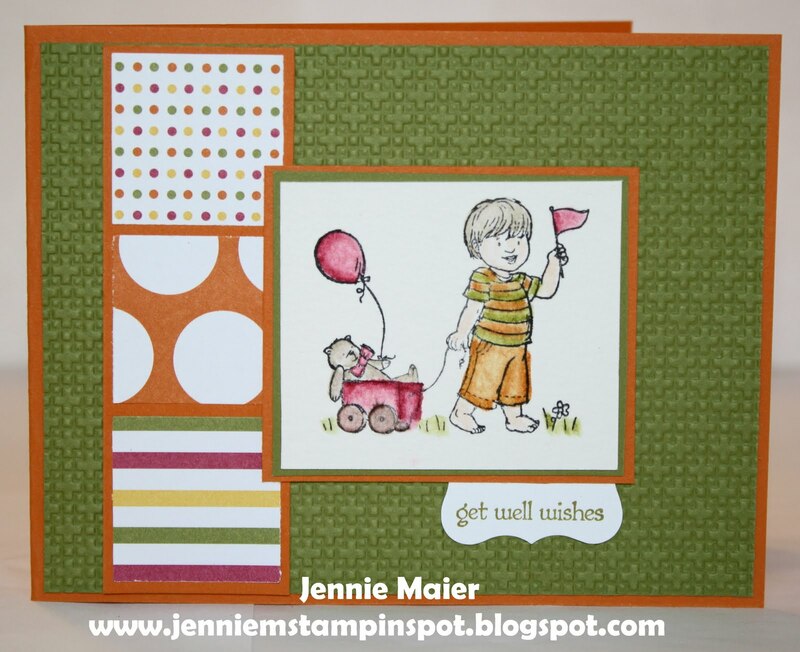 I made this card for the SUO Challenge#24-Get Well cards, here. The base is Lucky Limeade and then I added some Concord Crush card stock and a paper from the Cheerful Treat DSP. I punched out the flowers with the Blossom Bouquet Triple Layer punch and Lucky Limeade, Bashful Blue, Melon Mambo, and Concord Crush card stocks. The Cheerful Treat DSP for the center of the flowers was punched out with the 3/4 inch Circle punch. I popped up each flower with a Stampin' dimensional. I also popped up the entire square piece with Stampin' dimensionals. I stamped Get Well Soon from Sincere Salutations in Concord Crush and punched it out with the Large Oval punch. I layered that onto a Concord Crush piece punched with the Scallop Oval punch. Finally, some 3/8 inch Lucky Limeade ruffled ribbon finishes it off. I used the MojoMonday Sketch#202 here for this anniversary card. I also used my Color Coach to get this color combo of Baha Breeze, Island Indigo and Rich Razzleberry. The base is Island Indigo card stock and I added some Baha Breeze and then Baha patterned paper from the Pocketful of Posies DSP. The Razzleberry paper is also from the Pocketful of Posies DSP. I stamped the flower from Vintage Vogue in Razzleberry, cut it out and added an Island Indigo Designer Printed Brad. I used my Stamp-a-ma-jig to stamp the greeting from Vintage Vogue in Island Indigo. I put that all on a Whisper White circle that was cut out with the Circles#2 Big Shot die. That was layered onto an Indigo piece punched with the 2 1/2 inch Scallop Circle punch and popped up with Stampin' dimensionals. I stamped the triangles from Pennant Parade in Baha Breeze and cut them out. Finally, some 1/4 inch Rich Razzleberry grosgrain was snipped out with scissors to create the banner look. I made this for the Stamping 411 Sketch#214 here. The base is Daffodil Delight card stock and I added some Wisteria Wonder and some paper from the Flirtatious Specialty DSP. 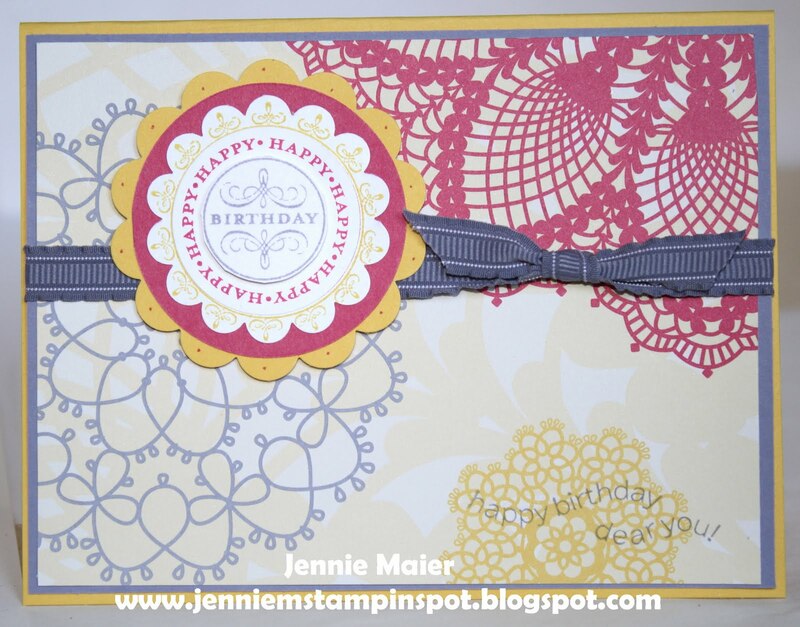 I stamped the image from Happiest Birthday Wishes three times in Daffodil Delight, Melon Mambo and Wisteria Wonder. I punched out the Daffodil piece with the 1 3/4 inch Scallop Circle punch. I used the 1 1/4 inch Circle punch on the Mambo piece. And the 1 inch Circle punch was used for the Wisteria piece which I popped up with a Stampin' dimensional. I also used the Circles#2 Big Shot die for the Mambo Circle and the 2 1/2 inch Scallop Circle punch on the Daffodil piece. I then popped up the entire piece with Stampin' dimensionals. I stamped the happy birthday dear you greeting in the corner with Wisteria Wonder. Finally, some 3/8 inch Wisteria Wonder ruffled ribbon finishes it off.